I am SO not a storyteller. I read books – I need a script. I admire storytellers immensely, but it’s just not me. Plus I talk too much. If I were to hone my storytelling skills I might be unstoppable. So for me it’s books. But storytelling is a great thing to encourage in young children. Storytelling encourages imagination and creativity, increases vocabulary and helps communication and listening skills. If you quietly sit and watch a young child engaged in free play you’ll often hear snippets of the incredibly complex worlds and characters they are creating. 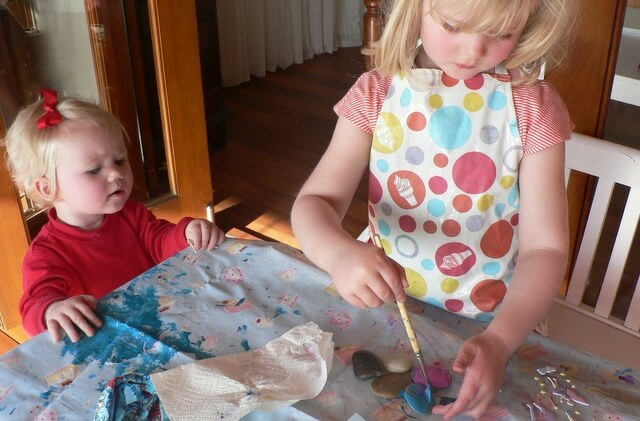 Very young children can sustain their stories and free play worlds over days, weeks, months…coming back time and time again to the characters and settings of their stories and making them more elaborate. Storytelling though free play is also a way for children to make sense of their world, problem solve, and see the perspectives of others. Dan has had two rounds of back surgery this year…it’s been a fun year. For months now PudStar has been playing and telling stories about babies who need to keep going to the hospital – babies with sore backs, scars and bandages. I realised the other day that her ‘treasures’ container was now a pills container and I watched her line up all her babies, give them all their medication and tell them to go to bed. Wasn’t so sure about the ‘pills’, but she’s obviously been watching, absorbing and responding! As children share their stories with trusted adults or peers, they are sharing and exploring their own worlds…their experiences, fears, joys and passions. The response they get from their audience helps them to communicate and make connections with others. It empowers them, and encourages their creativity and imagination. So with this in mind PudStar and I made some story starters, which I have always loved using when teaching early childhood classes. The idea for a story is often the hardest to find: story starters are prompts for stories – storytelling or story writing. In classrooms, teachers might use pictures, a list of characters and settings, or a piece of music to prompt ideas for a story. 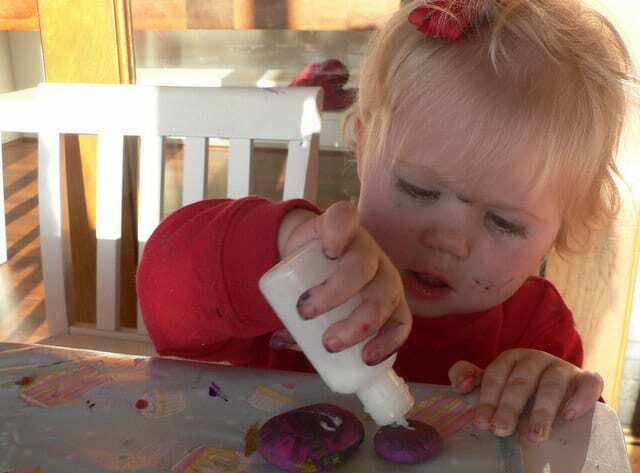 Story stones are perfect with young children as they are durable and ridiculously easy to make, with just a few supplies – in this case from Riot. 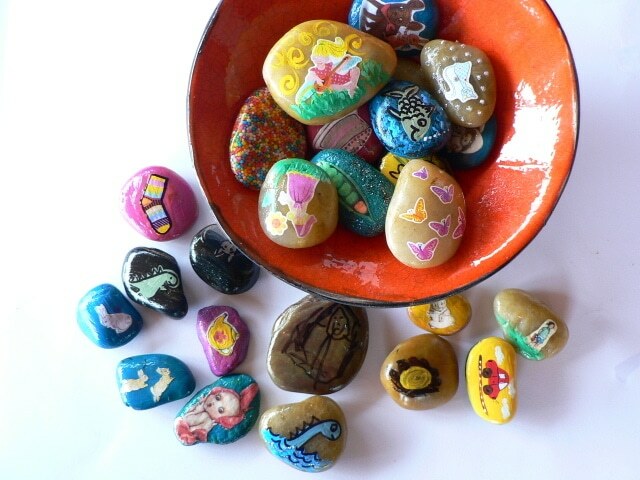 You can paint the stones if you wish, and then it’s a matter of drawing/painting characters, settings or props, and/or cutting out tiny pictures (Frankie magazine provided lots of our pictures). Then you simply glue and varnish. We used Mod Podge from Riot to glue and varnish. PudStar was in charge of backgrounds and picture choosing, I was in charge of intricate cutting and gluing. Chickpea? She mostly just got in the way and got squawked at by Pud. I also added to our pile some eggs shapes story prompts I made years ago when I had Year Two. The hundreds and thousands ‘stones’ are from‘Teal and Lime’. They are meant to be brooches or pendants but like them as stones. I’d like a whole bowl just of these! Take a bucket of them in the car. Children in the back can take turns pulling out stones and telling stories. The car is a time when I am captive and just have to listen to Pud…did I really just say that? Well it’s 20 minutes when she has my attention and we might as well use it for storytelling! Leave them around the home or classroom for free play. Not every session with story stones should be structured. Some of the best stories will come from times when a child picks up a stone or two and incorporates them into their free play. 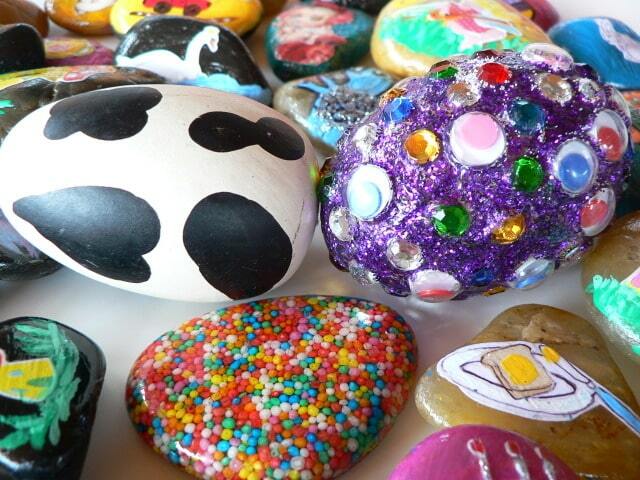 In a classroom or group, choose a stone from a bag and tell or write a story about that stone. Help the child to identify if their stone might be a character in a story, a setting for a story, or a prop/object for a story. Sort your stones into characters, settings and objects. Use several stones to tell a story: a collection of characters, or a setting and a character. Lay them on a desk, picture side down. 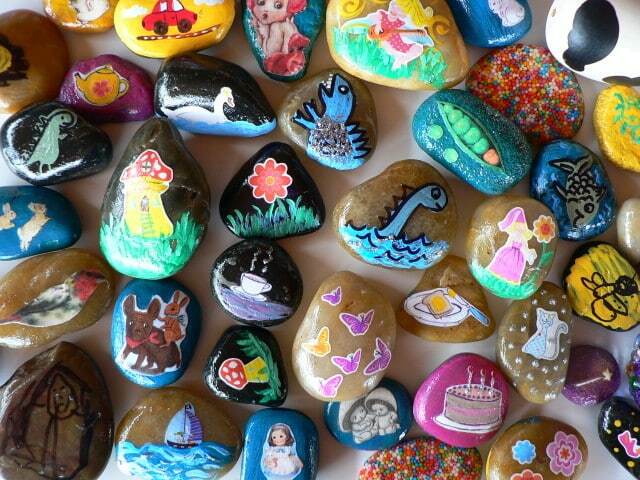 As a child chooses a stone to flip over, incorporate the picture into a story…great for plot twists. This can be a group or individual activity. Give a bag of story stones as a gift to a friend. 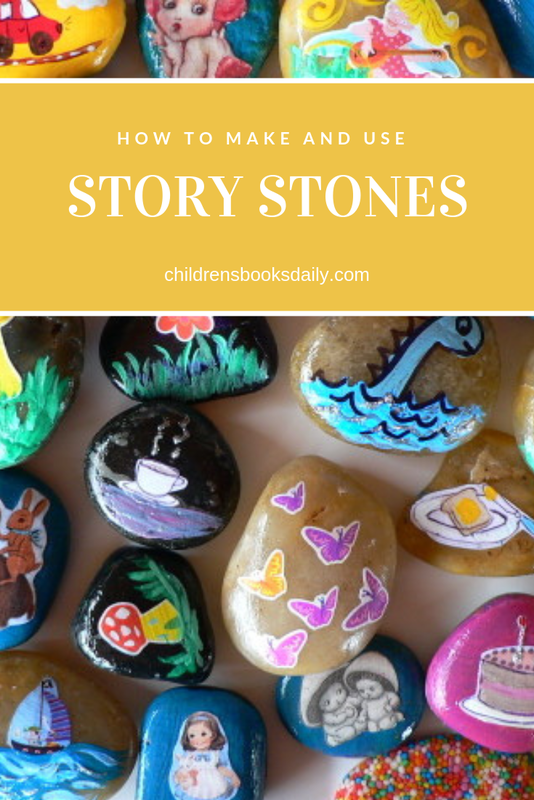 Create sets of story stones about themes…a set of fireman and rescue worker stones or some schoolyard stones – which would be perfect for exploring and problem solving schoolyard issues. Draw ‘sets’ for your stones. 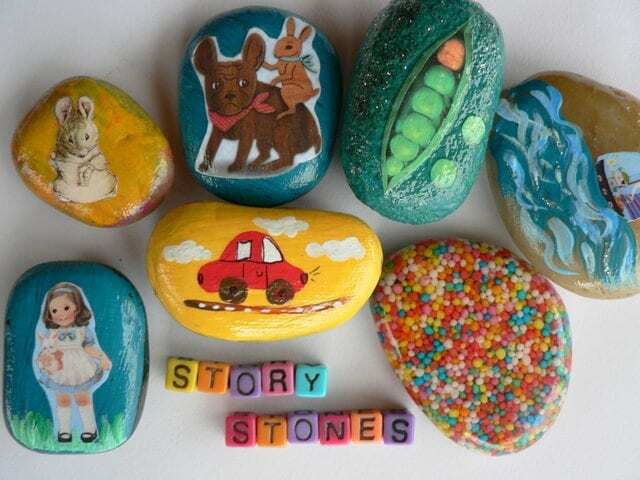 Have children draw or find pictures of a beach, a stage, a fantasy castle and use the stones to tell the story that is happening in the setting. Actually I can’t think of another way right now…post me an idea in the comments section! How slack am I?! Thanks for sharing with me at Dilly-Dali Art! I’m going to try these. And looking back at these pictures of PudStar and particularly Chickpea! Sooo cute!